Native American journalist and professor Mark N. Trahant will organize a previously denied journalism lecture series, bringing reporters who covered the Dakota Access Pipeline at Standing Rock to the University of North Dakota (UND). After Trahant garnered media attention last Thursday for his decision to leave his endowed professorship following his proposal’s earlier denial, UND announced Friday that it would move forward with the journalist’s lecture series. Before the university switched its position to host the journalism lecture series, Trahant, an independent journalist and the Charles R. Johnson Endowed Professor of Journalism at UND, claimed that it was a fear of retaliation from the state legislature that influenced senior administration at UND to put his series on hold. Last year, Trahant proposed hearing from journalists who covered Standing Rock after the university asked him to coordinate a journalism lecture series. This series was “put on hold,” he said. This year, the professor proposed a conference on technology and society that would lead with conversations on social media’s role in shaping the Standing Rock narrative. The second proposal’s denial prompted Trahant to express his disappointment with the university, which he thought should be an institutional leader and “beam of light, shining on the protected realm of rational discourse,” an October 26 Facebook post said. “The University of North Dakota senior administration has never, to my knowledge…expressed any fear of retaliation by the North Dakota Legislature or by North Dakota legislators related to academic content,” the statement read. “President [Mark] Kennedy does like the idea of an event that takes a balanced look at the DAPL issue,” Johnson concluded in a statement to journalists. With his event now scheduled for March 2018, Trahant is reaching out to speakers and other journalists with plans to expand the series into an all-day conference. In a Facebook post update, he stated that the university’s “Hagerty Lecture” will offer a “serious examination” of the media and Standing Rock: “Ideally we will look at two areas, independently, the role of the news media and how a narrative was created and shared via social media,” Trahant said. 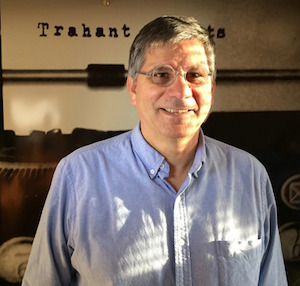 Trahant’s efforts to establish the journalism lecture series and his role as a Native American journalist call attention to the issue of diversity in the newsroom. He is a member of the Shoshone-Bannock Tribes in Idaho and he is a former president of the Native American Journalists Association. Trahant says that the premise for his lecture series comes out of a need for conversations, such as those about the Dakota Access Pipeline and Standing Rock, involving the larger community. Plans for the lecture series are underway but Trahant’s decision to not renew his endowed professorship still holds, as he is “thinking newsroom, not classroom.” He told Diverse he will leave his professorship at the end of his three-year term in May 2018.